We required a Russian transit visa to travel from Georgia to Kazakhstan via Russia. This information is for a transit visa only. No-one from any of the Russian visa agencies, Russian embassy in the UK, UK embassy in Georgia, Swiss embassy etc. could tell me if it was possible to obtain this visa in Tbilisi. When we telephoned the Russian embassy in Yerevan, Armenia to enquire about getting a Russian transit visa from Yerevan or Tbilisi they actually told us it wasn’t possible and you had to be resident in Armenia/Georgia for 90 days. 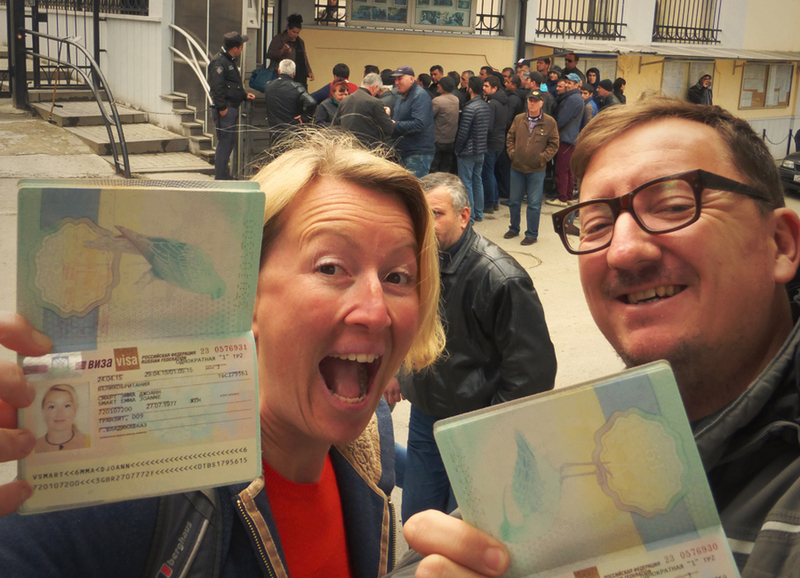 This seems to be the case for tourist visas but we decided to try in person in Tbilisi anyway. Transit visas are issued from the Russian Interests Section at the Swiss Embassy in Tbilisi (for location click here). Don’t go to the actual Swiss Embassy, the Russian Interests is a different building across the other side of the city. We have British passports but pretty sure it will be the same for all EU countries, I think it’s best to check directly as trying to get information online, by phone or email is pretty much impossible. The embassy is open 9am - 2pm for applications, there were two very helpful young guys who spoke English who ushered us through into a waiting room and asked us to wait 20 minutes for the Diplomat to arrive. Dimitri arrived exactly 20 minutes later, perfect English, very helpful, said a transit visa would be no problem and take 10-days to process and gave us a list of what we needed. You need to know the exact entry and exit dates into and out of Russia and they will look at your route and decide how many days your transit visa can be; we only had 3-days. They are very strict on this so plan your route and time carefully. As a rule we read that they expect you to travel between 400-500km a day. Hotel booking confirmations (if you use www.booking.com you can always cancel afterwards without paying anything). We also used these hotel bookings (name, address, telephone number) as our ‘contacts in Russia’ in the application form. On our return the next day we arrived at 10am, went straight to an application window, submitted our documents and paid the $60. We were given a receipt (keep safe - you need this to collect your passports) and told to come back at 2pm 10-days later to collect our passports and visa. All done in 15 minutes. We collected our passports and visa at exactly 2pm 10-days later, absolutely no problem - the guys let us in early to wait and all embassy staff were very friendly and helpful throughout. Before you arrive into Russia makes sure you are carrying some Rubles (рубль), it is illegal to pay for anything in Russia with anything but Rubles. You'll find plenty of money exchanges in Georgia, we didn't see any exchanges at the border but I'm sure there is one. The drive from Tbilisi north along the Georgian Military Highway is beautiful - worth a couple of nights and possible to camp at Ananuri Fortress and around Kazbegi. Be warned though, this route is often closed during the winter months. We arrived at the border just after 8am on a Wednesday. We drove straight past the huge queue of trucks (around 50!) we heard that queues can be horrendous for cars also so maybe an early start is better? Exiting Georgia is no problem, just a passport stamp, then a short drive to the Russian border. For passport control you need to fill out a double-copy immigration form which they hand to you when you arrive (it’s in English/Russian)- submit both, one will be returned, keep it very safe (you need it to exit Russia- make a few photocopies, hotels and police may ask to see it when in Russia). When you hand over your passport make sure it doesn't have any money in it - this is considered a bribe and illegal. For the car you need to fill in a temporary importation declaration document (double copy- one for entry and one for exit). This form is in Cyrillic from inside the customs hall but you can complete it in English and at Verkhny Lars they have an English translation stuck on the wall. A customs officer helped us fill ours out - very helpful. Customs check was quick and friendly - peered in a few boxes, the cooker, fridge and roof tent, checked the jerry cans were empty and got asked if we had any guns. The whole border crossing took a speedy 1hr 35 minutes. Finally, if you haven’t got Green-Card Insurance make sure you buy third party car insurance when you leave the border (no-one asked us if we had any at the border)- there is a café on the right and a few insurance broker offices. The minimum period you can buy for is 15 days which cost us RUB3071 (£37) based on engine capacity. We were stopped by police within a few hours of leaving the border and our insurance documents checked! It is illegal to drive without insurance in Russia but apparently you can travel from the border to the nearest big town without it - we wouldn't risk it as police checks are frequent due to unrest in nearby Ingushetia and Chechnya.